Earlier this year, I posted a recipe for the Russian (technically Ukrainian) staple borscht. Today I'll be continuing the Slavic theme with something that might not be quite as familiar to many readers: shchi, specifically sauerkraut or sour shchi. Shchi is a cabbage soup, and is such a part of Russian culture that there is even a old saying about it: "Shchi da kasha – pishcha nasha" which translates to ”Shchi and kasha are our staples”. There are countless ways of making shchi. My recipe is pretty simple, and is inspired by one by Muscovite Victoria Logunova. Heat a tablespoon or two of olive oil in a large pot with a lid on medium-high heat. Add the onion, stir for three to five minutes, and then add the carrots or celery. I usually use three carrots and three stalks of celery, but the recipe works just fine if you use a couple more or a couple less. While the vegetables are simmering, peel and cube the potatoes. You want each cube to be about 1" in size. Add the potatoes to the pot, followed by the water and the sauerkraut. 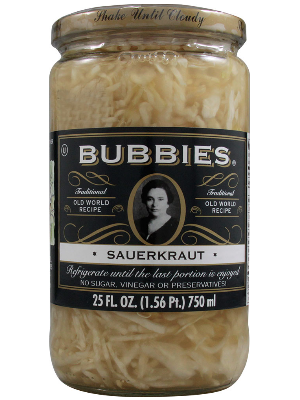 Don't skimp when buying the sauerkraut. Get a good brand. (Personally, I prefer Bubbies.) The sauerkraut is important as it is what imparts most of the flavor to the shchi, as it turns the water into a tangy broth. Give everything a good stir, cover, and reduce the heat to medium. Cook until the potatoes are soft, about 20 to 30 minutes, stirring occasionally. Once the potatoes are cooked to you liking, uncover, add the salt and dill, stir, and let cook for another five minutes or so. Sour shchi is great as an opening course or even as a meal, especially if served with some nice rye bread. It is a surprisingly good accompaniment to Japanese dishes, so if you are so inclined, have shchi and sushi while contemplating the Russo-Japanese War and Japan's decisive 1905 naval victory over Russia in the Battle of Tsushima. This recipe also works pretty well halved, but I recommend making the full batch, as shchi refrigerates and reheats nicely.